Identity Design Kent Fine Art, founded in New York City in 1985 by Douglas K. Walla, instantly built a reputation for presenting museum-quality exhibitions that referenced contemporary art trends. Opening contemporaneously with the Robert Miller Gallery, Kent undertook a dramatic renovation of the third floor of the historic Fuller Building located at Madison and 57th Street that housed their handsome modernist galleries. Kent closely collaborated with writers and mid-career artists of both national and international stature and commissioned Design Latitudes to create the gallery identity, catalogues, and advertising for their provocative exhibition program. Our design for the neo-modernist logo reflected the beauty, simplicity, and quality of the gallery, and it instantly became a highly-recognizable classic that stood apart from other galleries. We furthered the neo-modernist aesthetic for the first year of the gallery's exhibition promotions by introducing a pioneering style that captivated collectors, the media, and a few competitors as well. 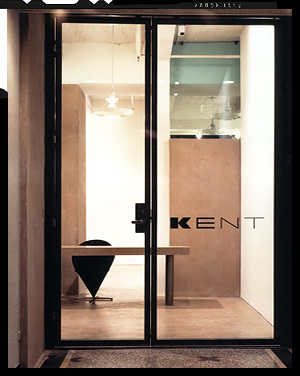 Our logo is still in use today with the current incarnation of the Kent Gallery in Chelsea.